The Bridge catalogs a year in the life of the Golden Gate Bridge, specifically the suicides and suicide attempts associated with the landmark. Tad Friend’s New Yorker article, “Jumpers” inspired Eric Steel to direct this as his first documentary. It opens with an unidentified man in black pacing the bridge’s walkway as he contemplates his options and sets the tone with footage of another man falling to his death. According to an Internet Movie Database summary written by G. Legat, Steel kept two cameras trained on the Bridge throughout 2004, documenting many of the jumps, thwarted attempts, and changes of heart. The underlying thesis of The Bridge is that people choose the bridge to attain release and remembrance because of its accessibility and because of its landmark status. 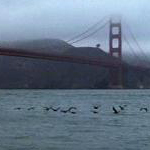 The documentary attempts to de-romanticize the idea of ending one’s life by jumping into San Francisco Bay. As the film progresses, however, the stories of the deceased and the accounts of random witnesses and friends become equally important. Long shots of the Golden Gate Bridge, still photos, and time-lapse sequences punctuate the stories of the deceased and the events that drove them to the action. These visual interludes attempt to provide an approximation of the silence, release, and finality that a jumper seeks, but no real insight as to why, of all the ways to die, one would choose to end it this way. The experience of photographer Richard Waters stands out among the thwarted attempts and changes of heart. He photographed a girl climbing over the edge. Fortunately, presence of mind prevailed and Waters grabbed her and prevented her jump. His story shows just how much of a cocoon we live in as individuals. It is not that we are callous or unfeeling, but, to use a molecular analogy, we are busy spinning at our own frequencies; our lives tend to do what they do. If anything, Steel’s documentary teaches us to be more aware of our surroundings and of people in need. Another incredible story is that of Kevin Hines; a young man who jumped and decided during his descent that he wanted to live. Miraculously, Hines survived and swam, injured, to shore, buoyed by a seal. While The Bridge may not fully demystify dying on the Golden Gate Bridge, it is an important step in documenting the nature, circumstances, and motivations of suicide. I hope that it will convince people to take an active role in getting others who are on the edge to step away from it. Marty Mapes: The man behind a new film about suicides on the Golden Gate Bridge talks to the BBC News website.